A flower arrangement may include live or cut bloom selections. These are arranged in a pleasing way that best suits the blooms. A single bloom theme may be used, or a particular mixture of them. The types of flowers used may also depend on the occasion it is for. Some blooms are more frequently used for some occasions than others. This makes it important to plan for the event they will be used for. Cut assortments often require only water to keep them fresh. They will last between a few days and up to a week for some choices. This is why freshness is important when ordering cut bouquets. The temperature can also impact the quality of the flowers. If it is too hot, they may wilt and fade faster than normal. Temperatures that are too cold may also cause shock or possible wilt. Light is not as important for cut blooms as it is for live ones. Live blooming plants require sunlight in order to keep blooming. This is important when sending them for certain special occasions. For funeral flower arrangements, peace lilies are among the best. The creamy white petals convey a sense of respect and sympathy. They are long lasting, and are used to symbolism lasting peace. Roses are another top choice for sympathy flower arrangements. White is a common choice, though some may prefer a deep red. For less formal arrangements, peach, pink and yellow may be used. Another consideration is where the arrangement will be used. Some may prefer to send a bouquet to the home prior to the funeral. This is often done after the news of one's passing has been received. A second arrangement is typically delivered to the funeral home. These are used to decorate the viewing area for the memorial service. These may be taken to the graveside, depending on the family's wishes. For more formal services, a third set of blooms may be used. These are often left on the casket, such as a blanket of flowers. Graveside specific bouquets may also be delivered to the funeral home. Memorial arrangements are another option for those who have passed. These are often left on the grave on specific holidays or anniversaries. They may be simple, such as a favorite bloom, or more elaborate. 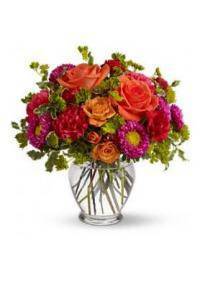 Types of flowers that are available for arrangements depend greatly on time of year and floral provider in the area. Cities that offer a range of choices include Santa Maria, CA, Thousand Oaks, CA, Portland, OR, Fall River, MA, and Fargo, ND. Rare and specialty flowers are typically ordered at least a week in advance. Wedding flower arrangements are often created by florists. Weddings typically require a large number of bouquets and centerpieces. These often have a central theme for flower type or color choice. White is a popular choice for many brides to make for weddings. They may require pops of color, such as pink or purple flowers. Some may request more exotic choices, such as green or blue. Some of the color choices may need to be specially prepared. This may include looking for exotic flowering plants to use. Other options include using a light or dark color tint for the petals. Some brides may seek out only their bridal bouquet for weddings. This is often chosen when a more basic wedding ceremony is desired. Others may prefer a number of bouquets to use for weddings.